When you make marinated mushrooms, you can add a whole other flavor to the completed dish. Whether you want to use them in a salad, as an antipasto dish, or even along side meat, marinated mushrooms is a great way to add complexity and depth to a dish. Before you get to choosing seasonings and spices for your marinade, make sure you are well educated on the basics. Taking the time to choose, clean and marinate your mushrooms will yield much better results. The mushroom is basically in two parts: the stem and the cap. When you make marinated mushrooms you normally remove the stem as it does not soak up the flavors of the marinade as well as the cap. There are exceptions to this rule of course and some mushrooms just aren't suitable for marinating. This edible fungus is a culinary gem that chefs use in many dishes from salads to entrees! The cap of the mushroom is unique because it acts like a sort of sponge that soaks up and takes on the flavor of a marinade particularly well. You should never be afraid to experiment with using many varieties of mushrooms in your culinary pursuits. However, unless you know a lot about wild mushrooms stick to your local grocery choices as wild mushrooms can be poisonous. There is a lot of discussion about cleaning mushrooms. Many chefs do not clean the mushrooms and nearly none will remove the gills. In the end this is a personal choice. If you do decide to clean your mushrooms, do not soak them or grate them, as they can easily be ruined. There are special mushroom brushes you can buy in order to clean off any type of silt you may find, but you can also just gently use your thumb to do this.You can also peel some mushrooms. Large portabella mushrooms can be peeled by reaching under the lips of the cap and finding a loose bit of skin, pulling it around the lip and toward the center. You generally will usually not use the stem from the large portabella unless you plan to chop it and then cook it to use for a stuffing. Though any mushroom can be marinated there are only a few that truly do the job perfectly. Agaricus and Cremini are two inexpensive mushrooms that are easy to find. These are the same mushrooms you find in cans and jars at the store. They generally retail for under one dollar. They may also be seen as White or Button mushrooms. The best mushroom to marinate is the portabella, particularly the "baby" variety. Feel free to experiment with seasonings and spices. In fact, if you find you're out of something. . .see if you can't find an interesting substitution in your pantry! All of these recipes require that you marinate for at least a full 24 hours, but you can leave the mushrooms marinating for up to three days. If you're pressed for time try this quick tip: Place the mushrooms and marinade in a vacuum sealed bag. 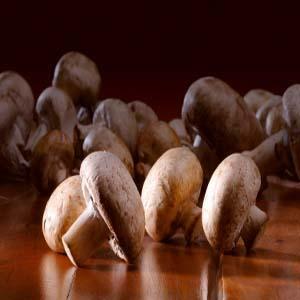 Your mushrooms will achieve full absorption after 30 to 45 minutes. Combine all ingredients in a bowl and stir until garlic powder is fully combined. Taste and add water if you desire a softer taste. The food in Italian cooking is known to be strong and rich in flavors. Whisk the vinegar while slowly adding in oil. Continue whisking mixture until emulsified. Thai food is known for being especially spicy. Combine all of the sauces together with the peanut butter and whisk until smooth. If the mixture is too thick, add water in very small amounts. Continue whisking until smooth and thinned out. Stir in garlic and scallions. Dice the mushrooms marinated in this mix and try on top of baked brie for a delightful experience. Marinated mushrooms using oil or alcohol can be stored for several weeks in the refrigerator. If using other types of liquids the mushrooms will keep for up to a week and a half.